Our great ranges of female shop display mannequins are all held in stock right here in the UK. This means we can get them to you much quicker than some other online suppliers who ship them directly from china to you. 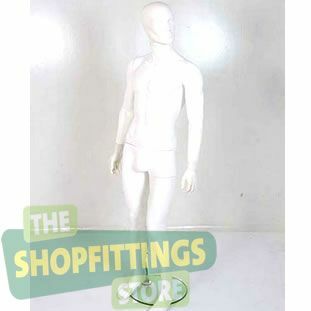 The Shop Fittings Store mannequins all come with a sturdy, high quality base with a metal calf spike fitting. This means they will stand without wobbling. Our range of Mannequins are small enough items to allow us to deliver them by parcel carrier. Delivery for 1-3 mannequins with be handled by parcel carrier, orders larger than 3 mannequins will require a small pallet delivery. If you are ordering your mannequins at the same time as larger items that require pallet delivery, then to save you money, we will include them on that delivery for you rather than charge you for a seperate delivery. Please check all items before signing for the delivery. If you sign for everything as ‘ok’ we will be unable to claim for replacements should you have damages.